Natural or artificial ponds, raceways (ponds akin to race tracks), and cascades (i.e., inclined surface systems) repre sent open cultivation systems for microalgae. All of them require a large area of anything from hundreds of square meters to hundreds of hectares. An overview of several open culture systems used for mass cultures of microalgae outdoors is presented in Figure 2. Due to the limited control of cultivation conditions, open systems are suitable for microalgal strains that grow rapidly, or under very selective conditions. Numerous variations of open ponds are used: according to local requirements, climate conditions, and materials available (concrete, polyvinyl chloride (PVC), fiber glass). Artificial shallow ponds of 50 ha are used for the cultivation of the halotolerant microalga Dunaliella in Western Australia to produce ft carotene. Productivity in these ponds is very low (~1g dry weight m 2 day 1) due to the lack of stirring mechanisms and CO2 supply. Raceways, tanks, and circular ponds are mixed by impellers, rotating arms, paddle wheels, or by the stream of CO2 enriched air supplied into the culture (Figures 2a and 2b). The culture depth can vary between 10 and 30 cm. The cultures are usually operated at a biomass concentration ranging between 0.3 and 0.6 gl 1 depending on the culture depth. Outdoor cultures are considered a photo limited system as they are operated at the opti mal concentration rather than at the maximum growth rate. Open ponds are preferentially used for Spirulina and Chlorella production in Japan, Thailand, California, Hawaii, Taiwan, India, and China. 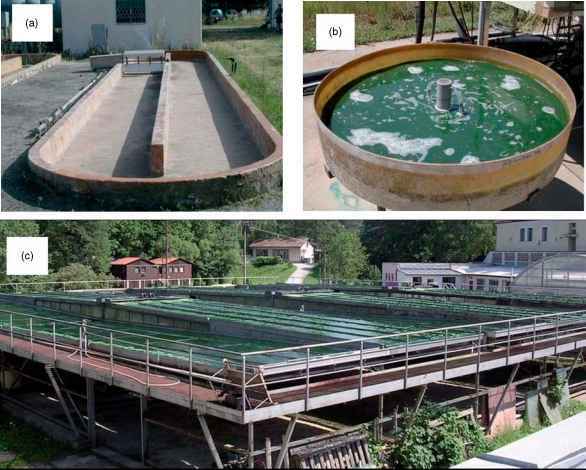 Figure 2 Examples of experimental, open outdoor systems for cultivation of microalgae, which can be scaled up to large production facilities (100001). (a) Raceway pond with a paddle-wheel mixer (25001) and (b) circular pond with a rotating arm (1001) at the Institute for Ecosystem Study of the CNR (Florence, Italy); (c) an inclined-surface system of sloping planes arranged in cascades (three modules of 22001 each) at the Institute of Microbiology, Academy of Sciences (Trebon, Czech Republic). cascade cultivation units, even in moderate climate zones. Yet, up till now, the system has not been fully scaled up, due to its higher construction costs compared to tradi tional ponds.